EAST RUTHERFORD, N.J. (AP) — Things are back to normal for the New York Giants. They lost a tough one to the Eagles after building an early 12-point lead. Odell Beckham’s Jr., who had spoken of running the table and making the playoffs for weeks, got frustrated after the setback and questioned coach Pat Shurmur’s play calling against a banged-up Philadelphia secondary. It ended with the coach fending off questions Monday about his decisions; his limited use of halfback Saquon Barkley in the second half; Eli Manning’s status as the starting quarterback; and his refusal to rebuke Beckham, saying his star receiver was venting after an emotional, last-minute 25-22 loss. Really, it was what one would expect with the Giants (3-8) heading into the final five weeks of the season with one of the worst records in the NFL and virtually no hope of getting to the playoffs. They are frustrated after winning six of 27 games over the last two seasons. 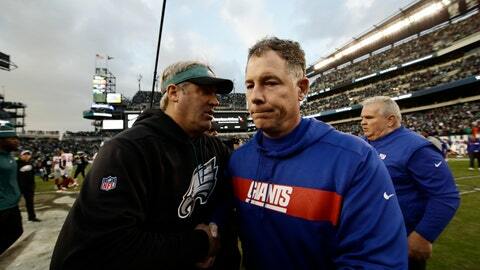 With that, Shurmur has to get the team ready to play the Chicago Bears (8-3) at MetLife Stadium on Sunday. As far as looking back on Sunday, Shurmur downplayed Beckham’s questioning the play calling, noting the Giants threw 37 times and ran 18. He noted the passing game had seven plays of 18 yards or better, one off the team’s high for the season. Beckham only speaks to the media on Thursday, so he was not available for comment. The big difference Sunday was the second half. The Giants had five possessions, including a three-play drive in the waning seconds, and gained three first downs. They ran 22 plays as opposed to 38 in the first half, when they scored on their first four possessions in taking a 19-12 lead. They were in position to try a late field goal, but Manning was intercepted on an ill-advised toss. Shurmur did not hesitate to say the 37-year-old Manning will remain the starting quarterback because he gives the Giants the best chance to win. He did not seem interested in questions suggesting the team should start rookie Kyle Lauletta or backup Alex Tanney with the season going nowhere. Manning also wasn’t interested in a change, saying he wants to play. He also believes the team will fight. The Giants have had trouble finishing the past two seasons, with Sunday the latest example.